Ally Girasole '10 works with associate professor Jean Hardwick examining neuron functions of the heart. IC neuroscience students will travel to Chicago this fall to present posters at the 39th annual meeting of the Society for Neuroscience. Students also have an opportunity to participate in the prestigious National Conferences on Undergraduate Research (which IC will host in 2011!). "Neuroscience is hugely popular around the country. There’s clearly an interest out there,” says Jean Hardwick, an Ithaca College neuroscientist specializing in cardiac neuron activity who directs the neuroscience minor along with Jack Peck, a psychologist specializing in behavioral neuroscience. Together, Hardwick and Peck inspire some of the most interesting student research on campus. Video slideshow by Nick Deel '09: Ally Girasole '10 describes her experiences working in the neuroscience lab with Professor Hardwick. "[The field of neuroscience] involves biology, chemistry, biochemistry, math, psychology, computer science, philosophy, physics … all these fields have factors in neuroscience nowadays," says Hardwick. Classes such as Neurobiology and the Behavioral Neuroscience Lab include opportunities to get hands-on experience in professor-guided labs. But students studying neuroscience must do much more than lab work. "As part of the minor, every student is required to do research," Hardwick says. "The best part of my college experience so far has been this research team," says senior Jeff Mank, a psychology major minoring in neuroscience. Working as part of a collaborative, student-staffed research team in Professor Peck’s lab, Mank studies the nervous system of a spiny lobster to understand how neurons work together to produce coordinated movements -- and discovers more about the neural processes that allow us to walk and talk and even make us scratch an itch! He’s been interested in the workings of the brain and nervous system since grade school. "I was only 12 years old, but I got extremely interested in brain plasticity ... I thought that was a pretty cool idea -- the brain can rewire itself," Mank says. Hardwick’s lab and team of students examine neuron functions of the heart. Students use intracellular electrical recordings to measure electrical activity in the heart in order to pinpoint the ways heart disease changes the heart’s functioning. "With heart disease still the number one cause of death in this country, research that will help us to explain how the body adapts to disease will in turn allow the development of better therapies and treatments," Hardwick says. Neuroscience minors can use their knowledge to research other areas of biology and biochemistry. 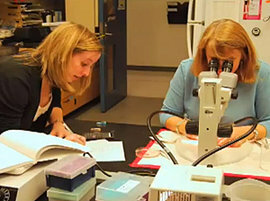 Other labs include associate professor Marina Caillaud’s olfaction lab, where research focuses on a species of herbivorous insect called aphids, and various behavioral biology research groups, such as Professor Marc Servetnick’s African clawed frog lab, in which neuroscience alumna Ana Velez, ’08, participated last spring. "We worked with a species of frog called Xenopus laevis, or the African-clawed frog,” Velez says. “I identified some promising … genes, and I was able to present my research at the National Conference for Undergraduate Research in the spring of 2008." Job prospects abound for students who study this up-and-coming field, especially at places like the Society for Neuroscience meetings frequented by Hardwick. "I bring students with me, and [last year] 3 of them presented [research] posters," Hardwick says. "One student was offered a job [while standing] at her research poster!" Katy Shepard, a 2008 grad currently pursuing her Ph.D. at Emory University, minored in neuroscience, and says, "[The neuroscience minor] has affected my goals in a major way -- I’m going to be a neuroscientist!" Jeff Mank has high ambitions, too. He dreams of going to medical school and earning his M.D. "I want to be a neurologist," he says. But what drew Mank to studying neuroscience, and what keeps him coming back, is the research he can do as an undergraduate. "I do a lot of my own research into neuroscience, independent of classes, and I’m motivated to learn on my own now," he says. "[Studying neuroscience] started as something I had a very basic knowledge of and has turned into something I’m actually very proud of," he says. What are you itching to study? Add a comment here, then check out Ithaca College’s science programs -- the lab is waiting!